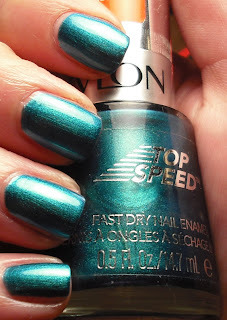 A few weeks ago I takled about Revlon Scented Ocean Breeze. I hated the smell of this polish, it was completely unbearable. What I did like about it was the color, but I refuse to tolerate the putrid smell for a pretty color. I even have my limits. There is an alternative, and I think a much better one. The Revlon Top Speed collection has a called "Ocean" sans the smell. I think the colors are almost identical, but I think the Top Speed is better overall. 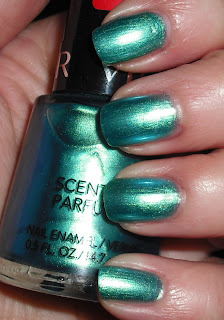 Ocean is a teal shimmer/foil. I think this has a slight kind of blue/purple duochrome too it. It's more prominent on the bottle than the nail, but it's nice nonetheless. You can kind of see hints of the duochromeness in this picture. Here is how it compares to Revlon Scented Ocean Breeze. I think Top Speed Ocean is significantly better. I think are similar in the sense of color. 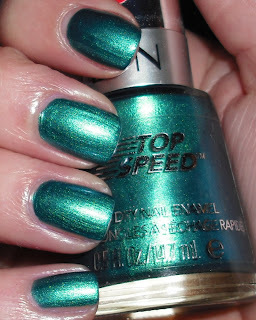 Top Speed has more of a foily finish versus Scented's frost finish. Also, the pigmentation and formula are far better in Top Speed. I say Top Speeds wins in this comparison, not just because it's missing the nasty smell, but it's an overall better polish. P.S. My parents are coming in town tomorrow for the weekend, so I may not have posts or they may be sporadic. I haven't seen them since October, so I'm excited for their visit! Have fun with your parents, can't imagine not seeing mine for that long, must be awesome to see them again! I like both colors, but if "Breeze" comes with a not-so-pleasant breeze, then forget it! Lovely colour, top one just wins for me.